I was all set to actually review a videogame today, when I clicked on my hulu queue only to find Pan Am’s pilot waiting for me. And because I operate by the laws of whimsy, that is now today’s post. You’ll have to wait until tomorrow for a rant on gender normativity in fantasy gaming. I’m sure you’re all super upset. Do you ever want to just pick up and fly away while looking perfect and gorgeous and knowing that you’ve got the best life possible given your circumstances? Yes? Good job, you’re a person. 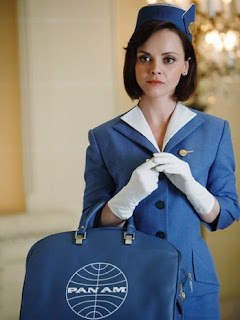 The ladies in Pan Am are also people, and thus they also want these things. But, unfortunately for me and the other viewers of this show, that’s about all they want. Each girl has one trait that defines them and gives them a reason to fly. Kate: (Smart, Not As Pretty As Her Sister) Recently recruited into the CIA to spy on foreign diplomats and passengers onboard. Laura: (Pretty, Escaping) Recently ran away from her wedding to become a stewardess like her sister, Kate. Now the face of Pan Am, after a candid shot of her ran on the cover of Life magazine. Collette: (French) Recently slept with a man in Rome, only to discover now that he is married, with a family. Angry at him, and herself. 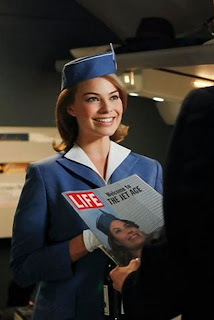 Maggie: (Bohemian) Recently suspended for violating the dress code, but now reinstated and promoted due to the disappearance of the senior Stewardess, Bridget. Seeing the world so she can help change it. And that’s pretty much it when it comes to character development on these ladies, sad to say. The plot is paper thin, just a woven strand of these four little pieces and another bit about the missing Bridget, and that’s it. There’s a touch of gravitas when it comes to Kate’s spying mission, but even that is couched in early 1960s glamor and soft jazz tones. I mean, I understand. This is ABC, home of the soapy Sunday night drama (Desperate Housewives, ahem), but I guess I expected more. 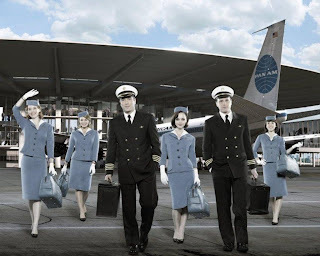 Pan Am is not feminist, and I never had any hopes that it would be. It’s firmly pre-feminist, as you can tell from the way the camera’s gaze hovers on the blue uniform clad forms of the women. They aren’t people in those uniforms, they’re stewardesses. I want some substance, even if I am aware that I probably won’t get it. They're in the backgound of their own promo shot. If you intend to base an entire show around women, then it stands to reason that you ought to make the women the agents of their own destinies in the show. This is not the case here. These women are no more the master’s of their own fate than the secretaries on Mad Men, and in the case of Peggy Olson, much much less so. Kate is manipulated by her male CIA and MI-6 handlers. Laura by the photographer from Life and by her reactionary choices: she has only decided to be a stewardess because it is what her former life wasn’t. Not because she knows who she is. Collette is bound by her sexual partners and judged by them, when they deserve the judgement more than she does. And Maggie, bohemian though they try to paint her, is at the beck and call of men who insist on strapping her into a girdle before flinging her around the world. I’ve always said that I would accept a lack of character agency when it was compliant with the needs of the show and explained by the character’s behavior and choices, and ideally, moved past as time went on. This is not one of those cases. Yet. I enjoyed this show, but it left a sour taste in my mouth, because try as they might to convince me that these women are the pinnacle of freedom, they seem awfully chained. I hope you're wearing a girdle. *That last one may be egregious, but she was the biggest disappointment of the actresses. She was incredibly flat, and seemed to be drifting through her lines.